Now that Christmas is over, it’s time to start to think about Valentine’s Day. If your other half is anything like mine, you’re probably clueless what to buy! 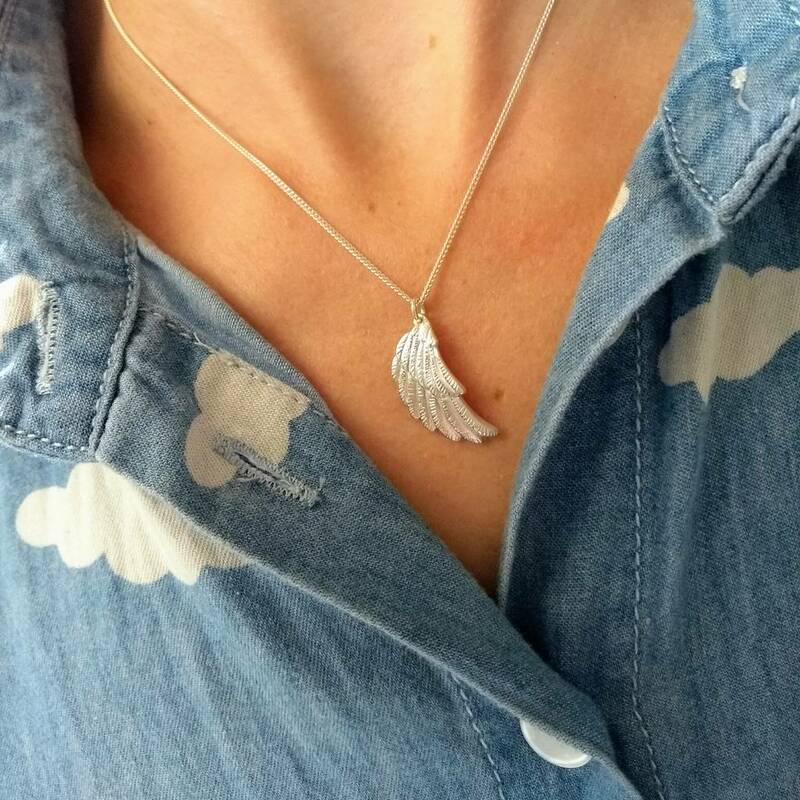 When the team at Jana Reinhardt got in touch to offer to give away one of their beautiful Handmade Wing Necklace to one of my readers, I was more than happy to agree! This beautiful necklace is sterling silver, and has an RRP of £89. The handmade wing necklace is one of Jana Reinhardt’s bestsellers, and it’s easy to see why! Tell Me More About The Handmade Wing Necklace! All of Jana’s jewellery is handmade, so it’s a one of a kind piece, without a doubt! This necklace is a wonderfully sweet way of promising to be someone’s guardian angel. It’s also a great way to keep someone you’ve lost with you. 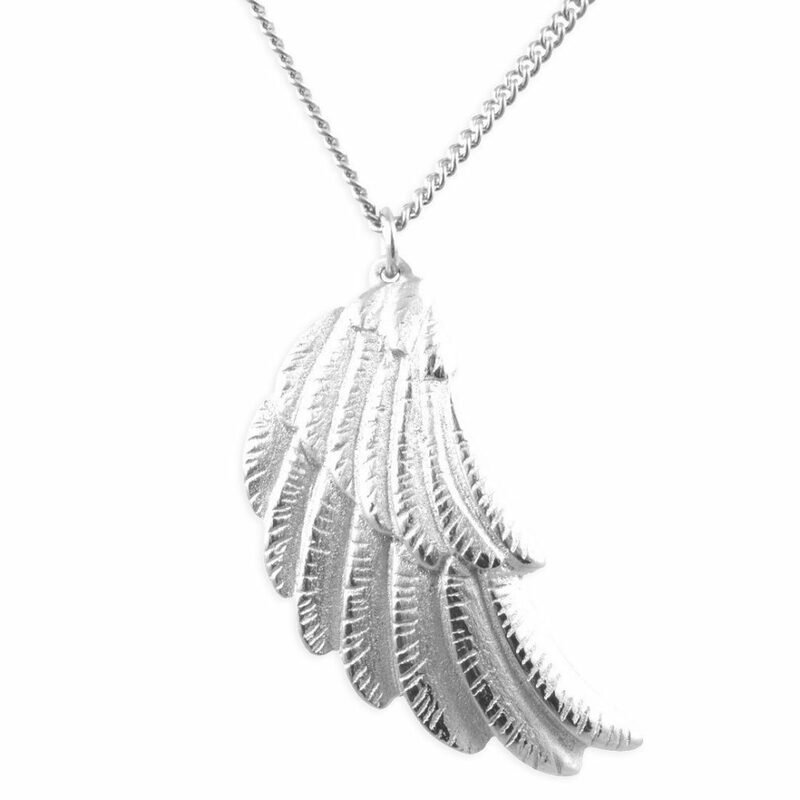 This wing necklace is contemporary, chic and more than a little fabulous! The wing measures 20x10mm, and the necklace can be worn at 16 or 18 inches (41 or 46cm). Jana and her business partner (and husband) Ross live in Worthing, West Sussex. They achieved their dream of living and working by the sea when they left the Big Smoke behind in 2012. Every Jana Reinhardt product is made in their seaside workshop. They are passionate about giving the personal touch to every single piece of jewellery they create. If you’d like to be in with a chance of winning this prize, all you need to do is fill in the form below. Don’t forget to comment, telling me the best Valentines gift you’ve ever given or received! I don’t think you can beat a dozen red roses to give or receive. I’ve never had a Valentine. The best gift I have ever received is a hand written letter – words are a way to a girls heart! A hand written letter – words are a way to a girls heart! A random suprise off my husband of 50 red roses to my work. Considering we rarely celebrate it, it melted my heart. I received a weekend break at a 4* hotel a while back. One of the best was probably getting a new chronograph watch. A night in a very posh hotel with sauna, meal, red rose delivered to our room…. A romantic weekend to Paris. A long weekend in Barcelona. I don’t think I ever received a Valentine’s gift, romantic or otherwise. One year I got balloons in a box – I loved that. My partner surprised me by with a dressing table once. I had flowers from my hubby when we first got together 15 years ago….that was the first and last time he got me flowers lol, so I have to say that, that was the best Valentines Day present that I have received. The only one I have ever received, a box of chocolates. We went for a lovely meal out last year, which was a nice surprise! A very pretty bracelet with i love you on it.It’s engraved with my name and a little message. Difficult one to answer, but I think the best ever gift is time spent with with my OH. i once was given a single red rose! i was over the moon! Breakfast in bed was the best Valentines gift I have received. Long stem red roses that were the nicest flowers I have ever recieved and I will remember them forever. I can’t really think of any! A staycation at the 4 Seasons! My partner got me a massage one year, it was totally amazing! My engagement ring, but no longer married to that man so hoping that this Valentines with my new boyfriend will be the best yet! This would make a great Valentines gift for my girlfriend. For me it had to be getting a theatre weekend break away which i loved! Flowers from my husband. Though the sweetest thing I’ve ever received is a card from a very shy boy at high school. When I was 7 my little classmate ‘boyfriend’ gave me a card with a lock of his own hair. He had sheared it off and left a bald spot – his mum was not pleased with him but it was very funny. An odd gift I know, but sweet and it has kept me giggling for 25 years! finding out expecting our daughter! I never really celebrate Valentines day as work for a big flower company and it loses its appeal. Last year I received a beautiful ring from my husband. A simple bunch of flowers is always appreciated! It’s sad to admit but I have never had a gift on Valentine’s Day. my eternity ring – after many years of marriage!! A stay at our favourite place each year. nothing fancy but it meant a lot to me, we had a 1 month old and very little money and he got my mum too have our newborn for a few hours and cooked me a lasagne, fancy table all set. it was so sweet. A night in a very posh spa hotel, luxury, pampered, then next day hit straight back to reality! my husband entered a competition to get roses and cupcakes that spelled out ‘I love you’ delivered to my work, loved that! A surprise weekend away – just when I really needed it! Breakfast in Bed – it’s great when Valentine’s Day is at the weekend. A night away at the hotel where we were married. A positive pregnancy test. I intended to wait until the weekend and buy a test on a day out as I was scared of bumping into someone I knew while buying it. But hubby clearly couldn’t wait that long and so I came home from a late evening at work to find fish and chips and a pregnancy test instead of chocs and flowers. Our daughter was born in the October. I have never in my life received a Valentine’s Day gift! My partner and I don’t celebrate, however it’s our anniversary around the same time so we make up for it then. We adopted a baby boy and he came home on valentine’s Day, don’t think I will ever beat that! An engagement ring was the lovely gift I had. A thoughtful gesture. It does not have to be expensive. Our first Valentine’s Day my husband wrote me a poem, 24 years ago now! It has to be the biggest bouquet of red tea roses that I’d ever seen. They were stunning, and I’ve never forgotton about them. I think the best thing I ever received was a surprise trip to Italy. The best I gave is a rare 1970s Japanese vinyl album. Hubby booked me in for an aromatherapy massage…..
My favourite was a handmade valentines card from my skint ex boyfriend when we were at uni! My best gift was a handmade card and a little devil teddy bear. It was so sweet. A weekend break to Italy! The nicest gift I’ve had was a beautiful bracelet. Thanks for the chance to win this lovely necklace. Never given a Valentines gift nor received one. My husband is pretty unimaginative so flowers is the best and only! Children at grandads and a home made dinner. Perfect. It has to be my engagement ring! A ring to upgrade my wedding ring. A home-made pop-up book. Personal effort and thought always comes up tops for me! I only ever get a card, but then I only give a card, so I can’t really complain! My husband is not very good at ever remembering valentines day and the one time he did he brought me dyed blue flowers so I guess you could say its the best and worst gift all rolled into one! I received a beautiful bouquet of red roses and it was a stunning gift! Diner especially made for myself. As weird and sad as it sounds, I’ve actually never given or received a Valentines Gift. 🤔 There’s always a first for it. I’ve never really given or received one to be honest! The best present is always a big box of chocolates! My favourite valentine gift was a handmade rose. This was made from bread, painted and varnished. So personal. The best valentine’s gift was my engagement ring! I’m not sure I’ve ever really received a valentines gift and have been happily single for the last 10+ years! I bought my boyfriend (now husband) a weekend break to Minorca. A long weekend in Prague. I bought my husband a wee cuddly teddy bear which was holding a red heart. Unknown to him I put it in his lunch box. He opened it up in front of his work mates much to their amusement. But secretly, he said, they were all a bit jealous. My son 17 years ago! Nothing else comes even close. A big warm jumper when I was a student in very cold digs! A surprise trip to Las Vegas. We had a great time! The best valentine gift I ever received was a tube of orange smarties in the days when you could not buy an entire tube. My husband (boyfriend at the time) had saved all of the orange smarties to make an entire tube. Loved it! a last minute trip to paris. We don’t go all out for Valentine’s Day we usually just treat ourselves to a nice meal. The oysters that we had last year were particularly delicious. Definitely a good present to each other. One year I received a Valentine’s Card sent via the companies internal mail. I never did discovered the identity of the sender. What a beautiful, dainty charm. Stunning. heart shaped naan breads my husband made me – loved them and him! A dozen red roses. They were absolutely lovely. Unfortunately, the man was not! Still, the flowers were great! A crappy card but it was my first one ever so it meant the most! MMMM Don’t remember ever getting anything! I’m a bloke so that’s maybe why!! A cosy weekend away to a log cabin with a hot tub!!! A new engraved wedding ring. Normally red roses are given. I was given yellow roses which stand for friendship but they were given with love. A lovely weekend in Prague it was amazing! I’ve only ever had one valentine and he got me a red rose! I was given yellow roses for friendship but given with love. My husband doesn’t normally get me anything, but last year he surprised me with a lovely box of very posh chocolates, which I really enjoyed. Not really had a lot, but chocolates always went down well. Never had a Valentine’s gift probably because it’s my birthday the day after! A gorgeous teddy bear from my husband when we first started dating. I’ve never had a Valentine or received a gift on Valentine’s Day.